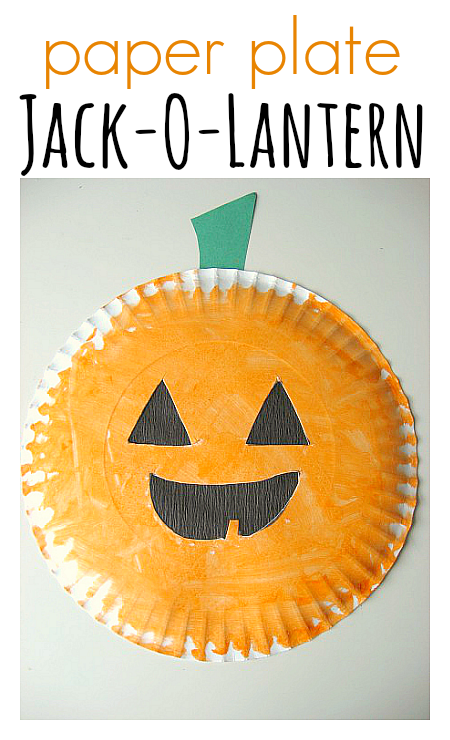 This is a classic paper plate jack o lantern Halloween craft, the addition of cutting is a great way to get some fine motor and hand eye coordination hidden into the crafty fun. 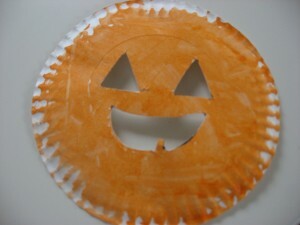 My son loved the cutting so much he said ” You do the sticky tape” when it came time to add the crepe paper to the craft. He was having fun , who am I to interrupt that? 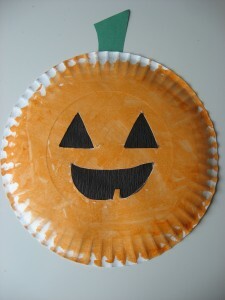 This easy Halloween craft can be adapted for tiny ones as well, simply have them finger paint. 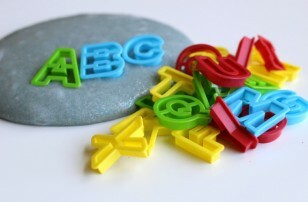 fter the craft don’t miss the simple fun game we played, and played and played. Gather your materials. 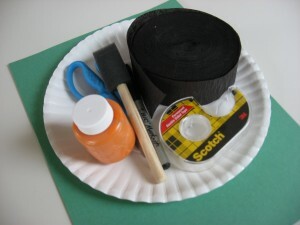 You will need a paper plate, a marker, some orange paint, scissors, black party streamers or tissue paper, double stick tape, and some green paper. 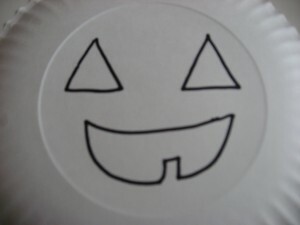 Start by drawing a jack-o-lantern face on your plate. Paint! I like using a foam brush because it covers well! 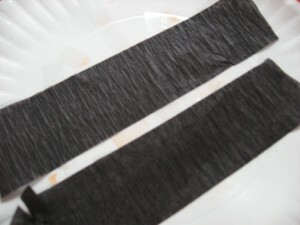 While it’s drying, have your child cut some black streamers . 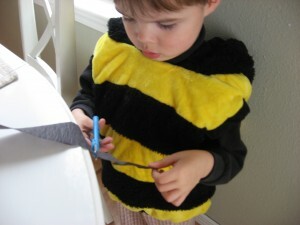 Like I said this was my son’s favorite part, he cut and cut and cut! Cut out the eyes and mouth. 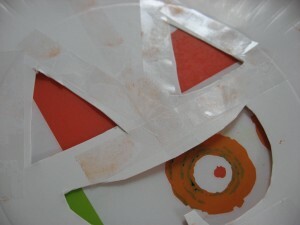 Add double stick tape around the mouth and eyes. Add the child cut streamers. 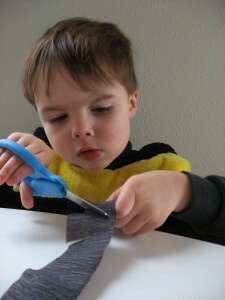 Do it yourself if your child is still cutting streamers, like mine. Add your green stem and you are good to go. 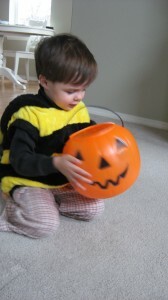 Using a holiday item like a pumpkin bucket is a great way to make a game like this novel . At my son’s preschool today they were throwing bean bags into a similar bucket so I adapted it a little ! My son was nuts about this game . Gather your materials. 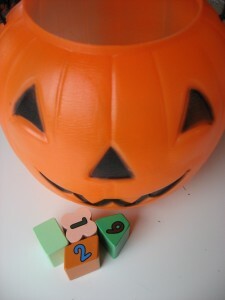 You will need some blocks with numbers ( or different colors, letters etc..) , a chair and a pumpkin bucket. 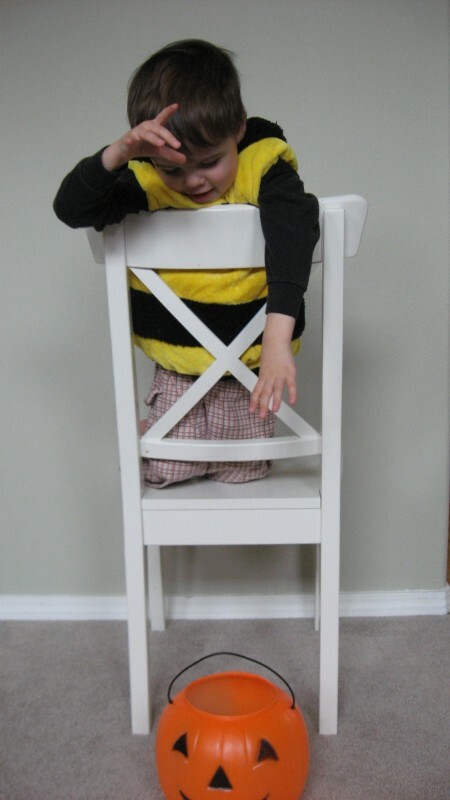 Set your child on the chair so they are kneeling. 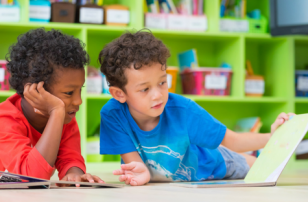 Make sure they are safe to sit like this, you can always just sit normally if they are tippy. 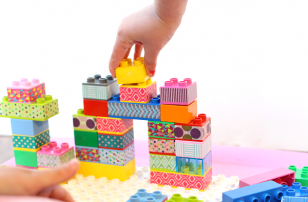 Hand your child blocks one or two at a time and ask them to identify the number on it, or the color, shape etc.. if they get it right they drop it in the bucket. If they miss the bucket they try again. My son shook the bucket full of wooden blocks once he dropped them all in, this was a high light ( for him) it’s really really loud. I was in a conference call yesterday and one of the questions asked was what Halloween books stood out for me this year. The following books are the books I think all families should have for Halloween! Where Is Baby’s Pumpkin? by Karen Katz. This lift and flap book is the newest addition to our Karen Katz collection. My son adores these books. I read this in the check out line 3 times and he was asking for more before I could get my groceries in the fridge. I like this book because it”™s a cute and gentle introduction to Halloween and all the creatures that go along with it. 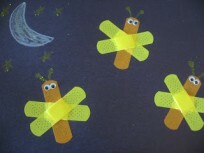 Also there are fun textures to many of the illustrations which help keep little hands busy! Edited for 2009: Even now a year later at almost 3 my son loves this book and it’s been read at bedtime multiple times in the past few weeks. Ghosts in the House! by Kazuno Kohara is on my must buy list! A little girl moves into house and soon finds out it is haunted. Luckily she is a witch and knows just what to do. The ghosts in the story seem mischievous but never scary and even when she washes them in the washing machine, they are still smiling! My son loved this book, the text was the perfect length for a 3 year old, short but still descriptive. I loved the simple black and orange colors and had to look at the copyright twice because I was certain this was written sometime in the 30s, nope 2008. The simplicity of the book and colors is balanced so well with the little details like the litt;e girl”™s constant companion , a white cat that puts on a black costume when the little witch pops on her hat. This detail had my son in stitches, “Cats don”™t wear clothes , silly cat!” . Absolutely a perfect Halloween book for children not yet ready to be scared for fun! 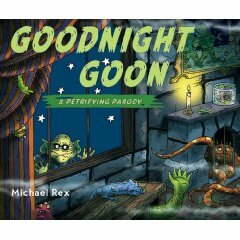 Goodnight Goon: A Petrifying Parody by Michael Rex was recommended by Anya Becker who says : This book is a parody on Goodnight moon! It is really cute and my son”™s all time fave right now”¦ he makes up read it about 20 times a day! Edited to Add my review : We loved this book, as big Goodnight Moon fans we were all laughing reading this before bed. My almost 3 year old thought that this was the funniest book ever made and would correct the book often with the original text . Thanks Anya for the recommendation ! .-= becky@oursweetpeas´s last blog ..What’s New? =-. 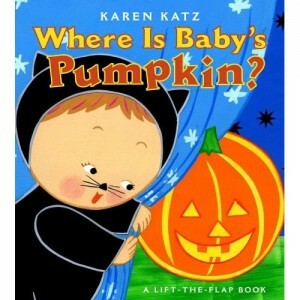 My son loved the Where’s Baby’s Pumpkin book when he was little. We also have the Goodnight Goon. My son likes to look for the detail in the pictures and likes anything this is “scary.” Great idea for a game — looks fun. Thank you! 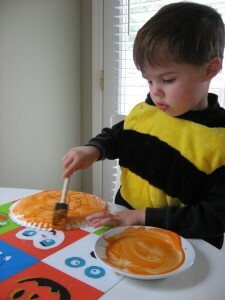 My 2 year old son LOVES Where is Baby’s Pumpkin. I think Goodnight Goon sounds really cute. I’m adding that to my wishlist for next year! 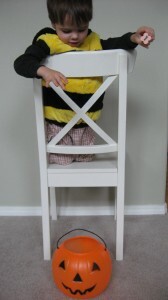 .-= Cara´s last blog ..Definitely My Kid =-. Great site! I have saved it on my lap PC. We were at Wal-Mart the day after Halloween and nabbed Halloween Jack (Roger Priddy) book in the Halloween section. They had Good Night Goon, Baby’s Halloween and many others. Also they were 50% off!! Thanks for all the great ideas. 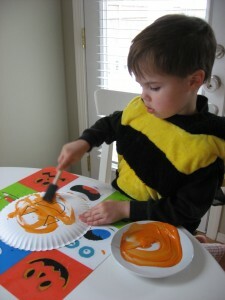 I am a SAHM with my 21 mth old son and we are always looking for neat ideas. Ohh I may have to run up there and see if there are any books left, how can anyone resist 50% off books?! 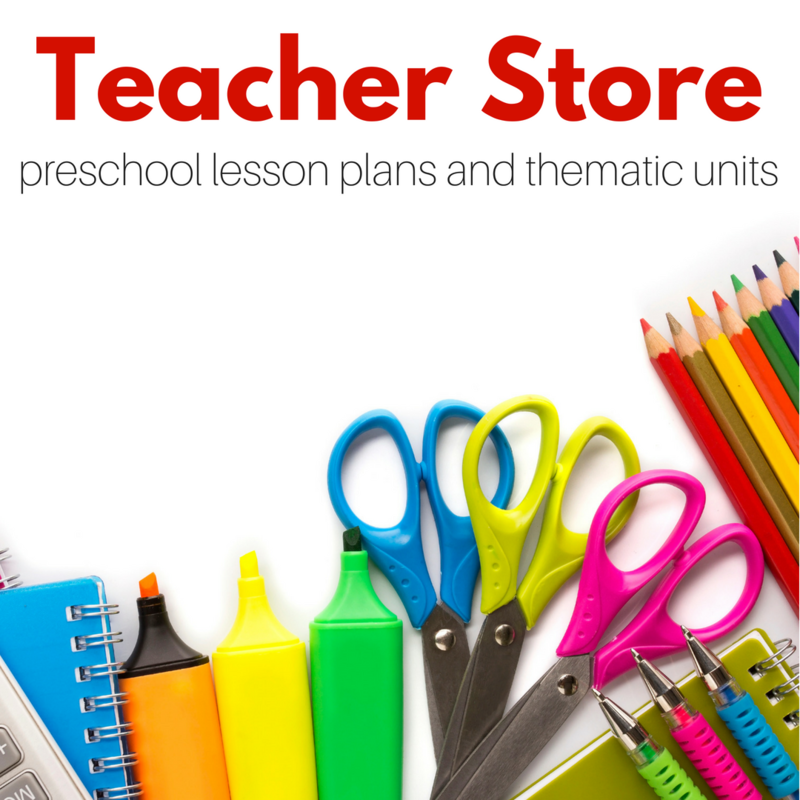 This is such a great idea and easy for both of my little ones to use.